There are many special birthdays, but there are not many that top the 80th birthday. 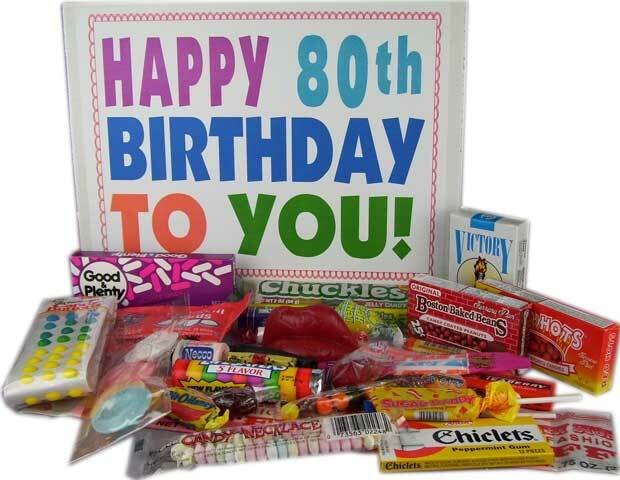 Children and grandchildren of the lucky person that turns 80 will usually scramble around town looking for the perfect 80th birthday gift basket. Some people will not know what to choose. Others may see a gift for birthday recipients that they would like for themselves. They will usually consider their own tastes in selecting a gift for someone else. The big thing that has to be considered is the uniqueness of the gift. In most instances people that are turning 80 have already had ever possible gift under the sun. It may be difficult to decide what gift would be good for someone that has everything. This is where a candy gift basket shines. Unlike all the other gifts that an 80 year old may receive, the candy gift will be different and quite pleasurable. The average 80 year old isn't going to eat the entire candy gift basket, but that is not the point. People that are up in age will always have some type of candy that has been their favorite down through the years. They may take a couple of their favorite pieces and instruct their grandchildren or the birthday guests to consume the rest of it. There are nostalgia candy gift selections that take people back to a time of their youth. This can be a magical experience that triggers some really great memories. A basket such as this is an excellence gift for birthday parties because it brings a sweet treat for the guests. Everyone that is around will usually have a favorite piece of candy that is contained in some of these baskets. People can get them with a lot of variety or filled up with the same piece of candy. Most people decide to go with the variety baskets. 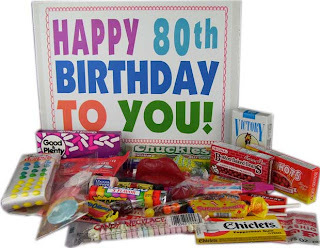 The 80th birthday gift basket can be filled with lots of different things, but the candy is always going to be the most unique gift. This is because most people just don't think about this. Many people are too caught up trying to get older people gifts that will complement their old age. Few people ever consider getting gifts that will nourish their youthful spirit. This is what all of the sweet treats will do. These products will help bring some life to any party or individual that is getting gifts. There are so many grandparents that are surprised that their loved ones were able to find some of the retro candy that is wrapped in these baskets. It will always bring a smile to their faces. This is a good thing because this is, after all, what birthday celebrations are about. People that are looking for gifts do not have to scramble in search of some clothes that may or may not fit. To the contrary, gift givers can just order some baskets of fun filled sweet treats. This is literally the sweetest surprise that you can give.